Another minister has gone in a deepening political crisis that threatens to engulf Justin Trudeau's re-election chances. Here's what you need to know. Mr Trudeau has been accused of pressuring his former attorney general to cut a deal with a company facing corruption charges - and retaliating when she refused to play ball. The revelations could cost Trudeau the October general election, some pundits say. 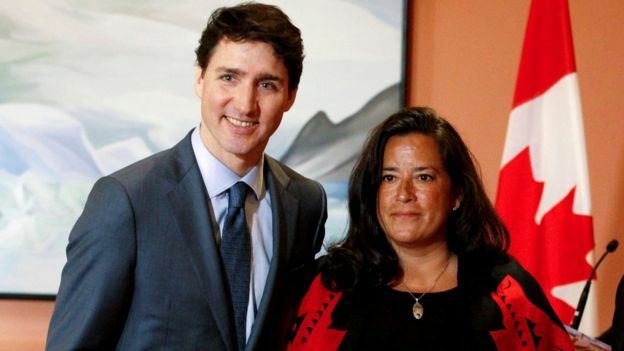 The former AG, Jody Wilson-Raybould, says Trudeau and his staff spent months trying to convince her that taking the company to trial would cost Canadians jobs, and their party votes. Now another minister, Jane Philpott, has quit saying it was "untenable" for her to continue due to "serious concerns" raised by the case. The spurned ex-minister: Jody Wilson-Raybould was Canada's attorney general and justice minister. Unlike in the UK, the two roles are held by the same person. She was also Canada's first indigenous justice minister and worked on a number of pieces of landmark legislation, including legalising cannabis and assisted dying. In January, she was shuffled from the justice department to the department of veterans' affairs - a move many saw as a demotion. The corporation: SNC-Lavalin is one of the world's largest engineering and construction companies. The company faces fraud and corruption charges in relation to approximately C$48m ($36m; £28m) in bribes it is alleged to have offered to Libyan officials between 2001 and 2011, when Muammar Gaddafi was in power. The PM: Justin Trudeau is Canada's prime minister. He won a majority government in 2015 on a platform of transparency, gender equality and a commitment to reconciliation with Canada's indigenous peoples. He faces a federal election in October 2019. The Trudeau ally who quit: Jane Philpott is described as one of his most trusted ministers. But her resignation statement explaining why she was quitting as Treasury Board president could not have been more pointed. Citing the SNC-Lavallin affair, she said: "I must abide by my core values, my ethical responsibilities, constitutional obligations. There can be a cost to acting on one's principles, but there is a bigger cost to abandoning them." Why would Trudeau care about SNC-Lavalin? SNC-Lavalin is based in Quebec, a swing province that has long been viewed as essential ground for the Liberal Party to win during an election - which is coming up in October. When the Liberals win Quebec, they often win a majority of seats in parliament. When they lose, they lose badly. At the time that Wilson-Raybould says she was being pressured to cut a deal, Quebec was also in the middle of a heated provincial election that eventually led to the ousting of Quebec Liberal premier Philippe Couillard. 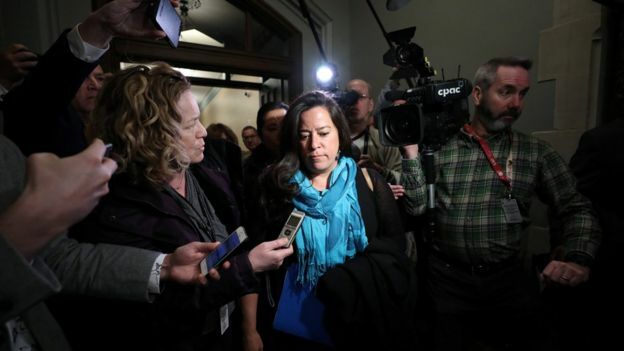 Wilson-Raybould says the federal Liberal Party kept raising the Quebec election as one of the reasons why she should consider cutting a deal with SNC-Lavalin. Trudeau has denied wrongdoing and says any lobbying by him or his inner circle for engineering giant SNC-Lavalin was done to protect jobs. Speaking to reporters on Thursday morning, Mr Trudeau said he disagreed with her "characterisation" of events and maintained his staff followed the rules. What could the fallout be? Trudeau's longtime friend and principal secretary Gerald Butts has already resigned. Many speculate that other top officials that Wilson-Raybould named may follow. Canada's ethics commissioner is investigating Wilson-Raybould's accusations to see if any conflict-of-interest rules were broken. For her part, Wilson-Raybould says she believes no laws were broken, but that the prime minister's office acted improperly. But the real question is what this could mean for Trudeau and his election in the fall. Conservative leader of the opposition Andrew Scheer has already called for Trudeau's resignation, saying he no longer has the "moral authority" to lead. That seems unlikely, but what is likely - at least according to columnist Chantal Hebert and other political pundits - is that "the Liberals will likely go in the fall election campaign with the SNC-Lavalin albatross still hanging around their party's neck".